The other day I mentioned that i LOVE leeks! I don't know what it is, but they just have this mild onion flavor that I am just loving. I am especially loving them with all things potatoes! 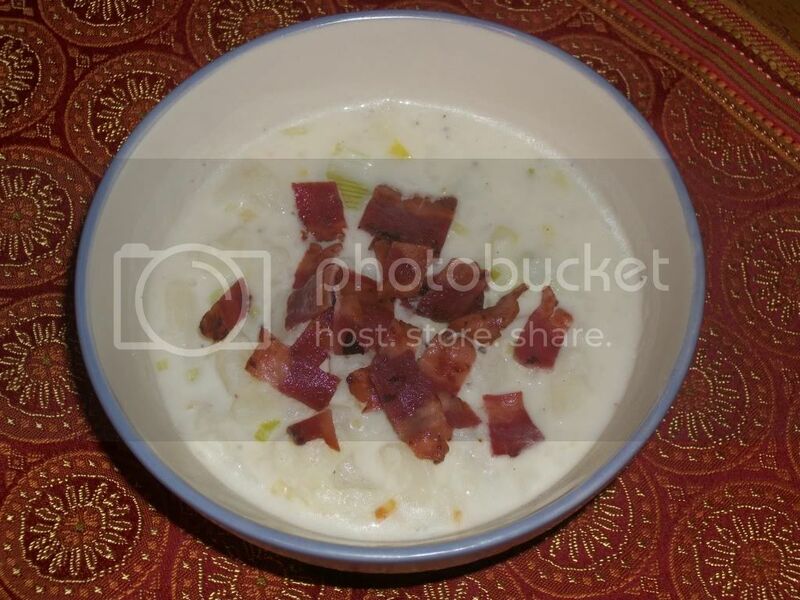 I also love creamy potato soup, and this soup is like liquid gold! It was so delish that I could not stop eating it! And it's not as bad as typical creamy soups because instead of using heavy cream, I used.....wait for it.....fat-free half and half. Yep, no fat, lower in calories, and still creamy! It totally worked and I will totally try this again with some other soups. Add salt, pepper and steak seasoning, or other seasonings you prefer, to taste. Think I will try this recipe soon because I like the idea of using fat-free half and half to make it creamy without adding too much fat. Using the steak seasoning is really unique. I must try it, I'm so used to garlic and Italian seasonings and wanting to try something different --- bold but not spicy with too much heat. Also checked out your recipe for Loaded Baked Potato Soup. Think it would be a tasty soup when there is not much time for cooking. Thanks for sharing.